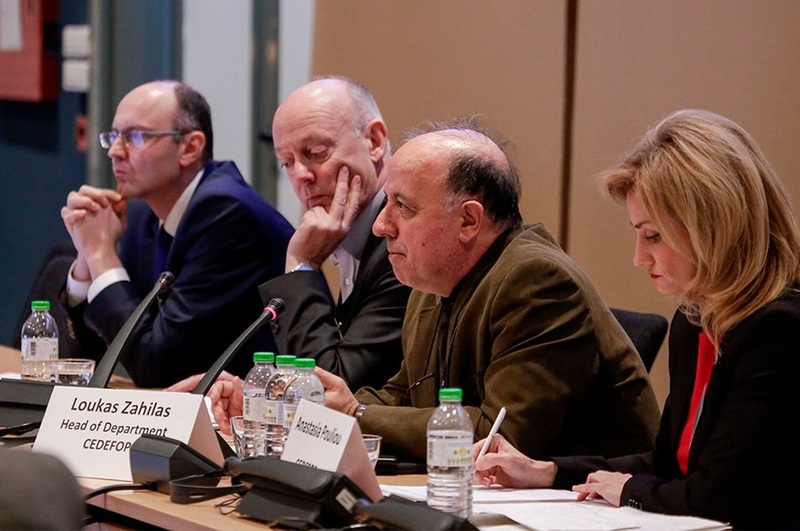 Cedefop's workshop on vocational education and training (VET) in the 21st century – future trends and priorities took place on 20 and 21 February in Thessaloniki. Over 40 participants representing researchers, policy-makers, learning providers and other stakeholders, discussed the changing nature and role of VET, shared knowledge and exchanged experiences about VET’s future at national level promoting cooperation on these matters in Europe. The workshop built on the interim findings of the ongoing (2015-18) Cedefop study on ‘The changing nature and role of vocational education and training in Europe’. This work, based on a combination of different research methodologies, aims at an in-depth insight into the overall standing and role of vocational education and training in Europe today. An important part of the research is to better understand VET’s dynamic character, which is why developments during the last 20-25 years are carefully mapped and analysed by the study. The workshop followed on from previous events in 2016 and 2017 and provided an opportunity to discuss how findings of the project’s different assignments can be synthesised and feed into the final ‘scenario’ part. It also played an important role in the planning of a series of events during the 2018 Austrian EU Presidency. Welcoming participants, Cedefop Head of Department for VET Systems and Institutions Loukas Zahilas highlighted the need to see VET’s future in relation to the tendencies on automation, demographic and economic developments. European Commission’s Jan Varchola presented the main policy documents in the 2020 agenda and the planning of the post-2020 policy proposals. In the plenary sessions, the issues of trends and data on enrolment in initial vocational education and training in Europe, VET’s responsiveness to external change and connecting research and policy-making were presented. In the working group sessions that followed, changes at national level were discussed focusing on how VET has changed between 1995 and 2018, which were the main changes and how it differs today, how it can respond to and balance between the need for rapid change and long-term stability and predictability, and which are the lessons for the next two decades regarding terminology, relabelling and labour market relevance. Cedefop expert Jens Bjørnåvold, who coordinates the project, summarised the results of the discussions and exchanges of ideas and referred to the next steps. In the concluding remarks, Cedefop Deputy Director Mara Brugia focused on the synergies of the project with other areas of Cedefop work saying that the ongoing work on the future of VET is a golden thread that weaves the fabric of a systematic VET approach, a core element of Cedefop’s work.